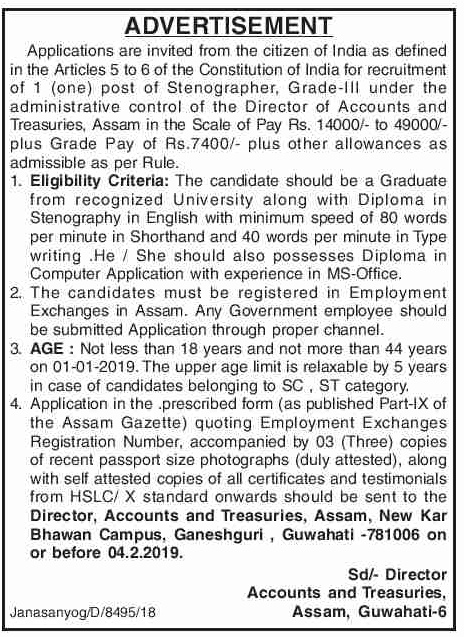 Applications are invited from the citizen of India as defined in the Articles 5 to 6 of the Constitution of India for recruitment of 1 (one) post of Stenographer, Grade-III under the administrative control of the Director of Accounts and Treasuries, Assam. a) The candidate should be a Graduate from recognized University along with Diploma in Stenography in English with minimum speed of 80 words per minute in Shorthand and 40 words per minute in Type writing He / She should also possesses Diploma in Computer Application with experience in MS-Office. b) The candidates must be registered in Employment Exchanges in Assam. Any Government employee should be submitted Application through proper channel. Age: Not less than 18 years and not more than 44 years on 01-01-2019. The upper age limit is relaxable by 5 years in case of candidates belonging to SC , ST category. How to apply: Application in the prescribed form (as published Part-IX of the Assam Gazette) quoting Employment Exchanges Registration Number, accompanied by 03 (Three) copies of recent passport size photographs (duly attested), along with self attested copies of all certificates and testimonials from HSLC/ X standard onwards should be sent to the Director, Accounts and Treasuries, Assam, New Kar Elhawan Campus, Ganeshgurl , Guwahati -781006 on or before 04.02.2019.